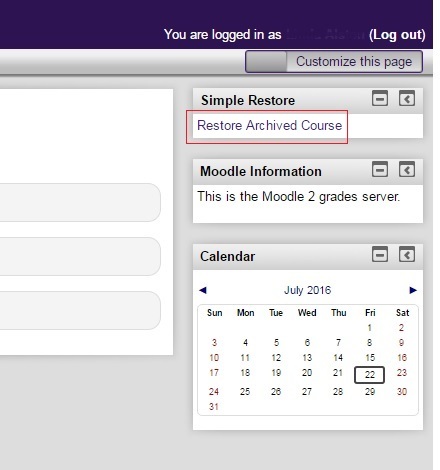 All Moodle users with instructor level permissions should use this server to access Moodle 2 courses from Spring 2012 to Summer 2016 for grade disputes or to reference student information for referral or other purposes. Courses will only be accessed on the grade server. You will not have access to the restored courses anywhere else. 2. Log in using your PAWS credentials. 3. Look for the Simple Restore block in the upper right of the screen. Click on “Restore Archived Course”. 4. In the “Short name” field, enter text to search for the desired course. You can use an easy search term, such as your name, or the department code and course number (Example: BIOL 1001). 5. Select the desired backup file. You will only see those courses where you have authorized access. 6. You will be asked “You are about to ‘Create new course from backup’. Proceed?” Click on the “Continue” button. 7. Wait for the restore process to complete. This could take quite a while, depending on the size of the course. You will get a message indicating the course was restored successfully. Click “Continue” to view the restored course. 8. Once the restore process is completed, the course will appear in the course list on the homepage. The user will have access to all course and student materials as well as grades. NOTE: No changes should be made to any courses on this server. This server is not backed up, so any changes to a course will not be saved.